This winter has been very cold this year which means we haven’t been spending much time outside! That being said, I need to keep my toddler busy with fun and engaging indoor activities. 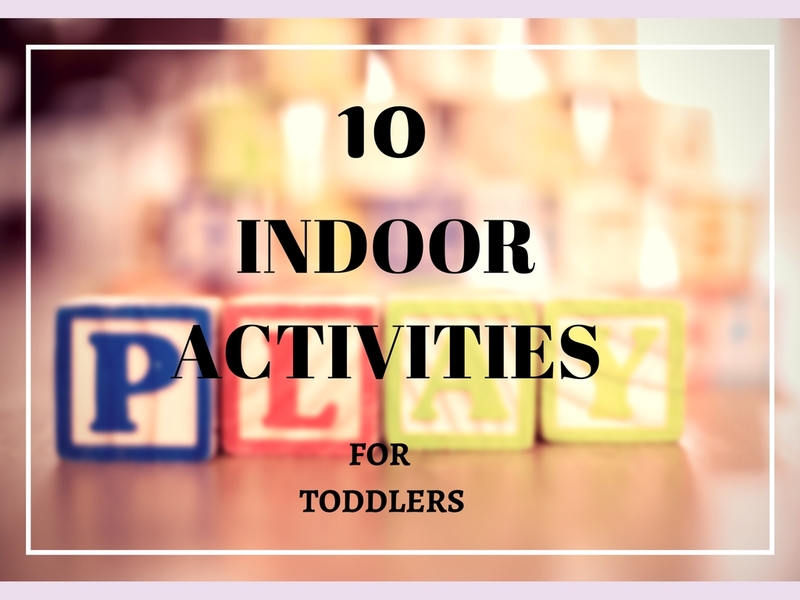 I want to share a list of simple and fun low prep indoor activities for toddlers. Sensory bins are an amazing indoor activity for toddlers that keeps them busy! There are so many ideas for sensory bins out there and they are so very easy to throw together. The main focus of a sensory bin is tactile play. Your child touches and plays with items in the bin. It is exploration and learning through play. To create your own sensory bin for your child you can use things like rice, pasta, beans or even cotton balls. Add in some small toys, magnetic letters, scoops, tongs and anything else that comes to mind. If you need some ideas check out my Christmas Sensory Bin. A new favourite activity for my little one is baking. I swear, everyday she asks me if we will be baking something. I let her scoop, sift, pour and sift. Cracking eggs is one of the tasks she always wants to do. She also loves to smell the vanilla extract and sample the goods as we bake. You turn around for one second and there is batter all over their little faces!! My daughter simply loves to play with magnets. She loves to take them off the fridge and play with them. We also use magnets like these magnet letters. It is a great way to expose your child to letters. You can let your child play with them on the fridge or grab a baking sheet and place the letters on there. Recently I have started using the magnetic letters to spell out simple words like “cat”. Another great educational toy for learning is this LeapFrog Fridge Phonics Magnet Letter Set that teaches kids their letters and letter sounds. If there is one thing my daughter loves, it is colouring. Almost everyday she asks if she can colour! If she had it her way she would color with markers but mommy isn’t too keen on letting her use markers… even the washable kind! I prefer crayons and colouring pencils. Less fuss and less mess! She likes to colour and “write” on blanks sheets of paper but also enjoys using colouring books. For Christmas she also received a neat mess-free marker and paper by Crayola. The marker does not leave marks on anything other than the special paper! I was very happy about this gift! Reading is very important in our house. My husband and I want to instill an appreciation and love of reading in our kids at a young age. I am always keeping an eye out for good books for the girls. My toddler loves books and loves when we read to her. We read to her throughout the day whenever she asks us to. Bedtime stories are also a big part of our night time routine. Sorting games are quick and easy to setup which makes them great indoor activities for toddlers. There are so many different items for toddlers to sort, which makes this such a great activity. Your toddler can sort blocks, pom poms, sorting cups, buttons, and pipe cleaners. Oh my goodness! This one is something that my daughter gets a thrill out of. Toddlers love to stack blocks and knock them over. It is sheer delight to watch those things fall. Here is a stacking block set your little one may love. Doing crafts is a great way to let your child be creative. It is also nice to have some sweet keepsakes as they get older. I try to stick to simple crafts that are easy for toddlers to do. I really love paper plate crafts because they are so low prep! Check out these posts for some fun crafts like these Paper Roll Owls, this Ladybug, or our little Autumn Leaves Tree. Busy bags are a mom’s best friend and a perfect indoor activity for toddlers. A busy bag is simply an activity that is kept in a bag that your child can use on their own. It is an easy and engaging activity that requires little to no supervision on your part. Not only are they great for days you are stuck inside but they can be very useful when you need to prep meals! There are tons of busy bag ideas out there! The possibilities are endless. I made my toddler a felt Make Your Own Pizza busy bag. Playing pretend is so important for children. My daughter loves being a big sister but also loves to pretend to be a mommy to her baby dolly as well. She is also her dolls doctor and uses a play medical kit similar to this play set by Battat B. to take care of her. Kaliya makes sure to check for a fever, and gives her dolly medicine. Another form of dramatic play that she does is pretending to be a veterinarian. She has a vet set with a bunch of tools and she uses them to care for her stuffed animals. Kaliya also loves to play with her little pretend play cash register. She buys food with her card and enjoys pretending to eat all of the food! Want to save these ideas? Just Pin it for later!